Download our affiliate program PDF here! 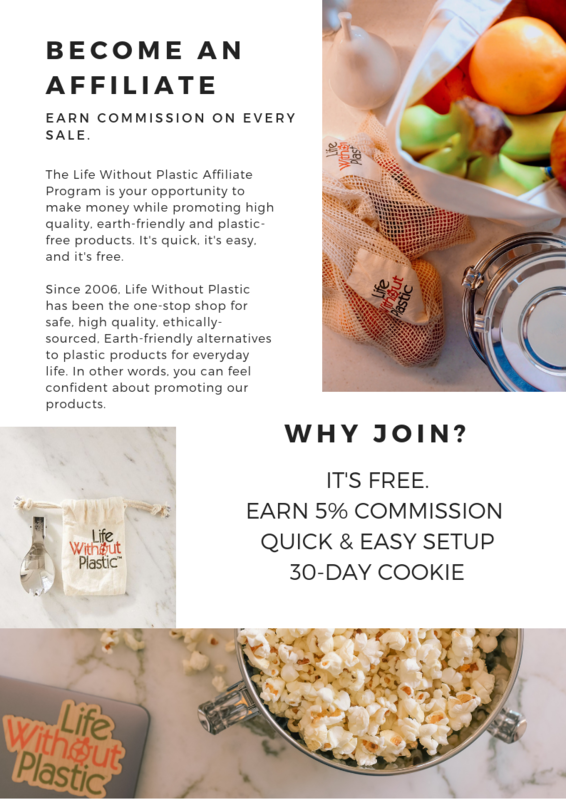 How about helping us promote a plastic-free lifestyle while earning commissions on traffic you bring our way?! Our program is free to join and requires no technical knowledge. All you need is a PayPal account. All direct sales generated via your site will be tracked, and a commission payment of 5% of the value of those sales (less expenses such as taxes) will be sent to your PayPal account upon request once your balance reaches the $20 level. A 100% win-win program You don't even need a website or a blog. You can earn commissions simply by talking about us on your Facebook, Twitter, Instagram or other social media accounts. When you join our affiliate program, in your account you will have access to a range of banners and text links that you may place wherever you like on your website or that you may use to talk about us on social media. When a user clicks on one of your links, they will be brought to our website and their activity will be tracked by our affiliate program. Once a purchase is completed from the traffic you send us, you earn a commission! You can check out your activity on a daily basis by logging into your Life Without Plastic account. In the account you are able to check out the sales you have generated, your account balance, and also see how your banners are performing. *Please note that the Terms and Conditions of the Life Without Plastic Affiliate Program Agreement are subject to change at any time without notice and at the sole discretion of Life Without Plastic. Coupons websites are not eligible for our affiliate program.